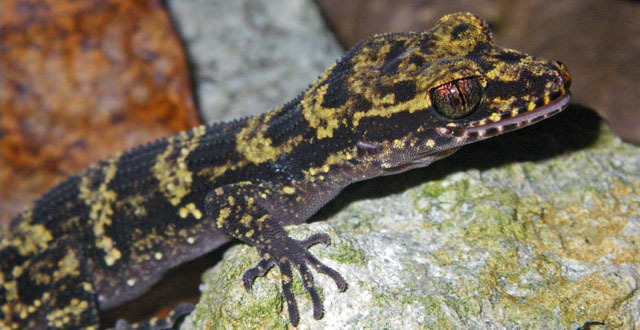 A team of biologists from the Papua New Guinea National Museum and the U.S. Geological Survey has discovered a new species of slender-toed gecko on Manus Island, the largest island of the Admiralty Islands, Papua New Guinea. The new species of gecko, described in the journal Zootaxa, measures about 5.7 cm (2.2 inches) in body length and is adorned like a bumblebee with black-and-gold bands and rows of skin nodules that enhance its camouflage on the tropical forest floor. Dr. Fisher collected two specimens of the bumblebee gecko on Manus Island in 2010 and analyzed their genetics to show that the lizards were new and distinctive. “This species was a striking surprise, as I’ve been working on the genus since the 1970s, and would not have predicted this discovery,” said Dr. George Zug, a herpetologist at the Smithsonian Institution and a curator emeritus at the National Museum of Natural History. “Exploration of Manus Province is in its infancy, with many new species possible, and this joint expedition was our first to this region,” added Dr. Bulisa Iova, a reptile curator at the Papua New Guinea National Museum.